Even though we are still in the midst of summer, my thoughts are beginning to turn to fall. I have to admit that fall is one of my favorite times of the year. I love the somewhat cooler days, the softening of the light, sitting by a cozy fire, and dreaming of a cabin tucked in the woods by a mountain lake. Well, as you can tell, I am definitely day dreaming as it was 90 degrees here yesterday. But, to feed my overactive imagination, I searched for some inspiration. Nothing says cabin more than rough log walls. 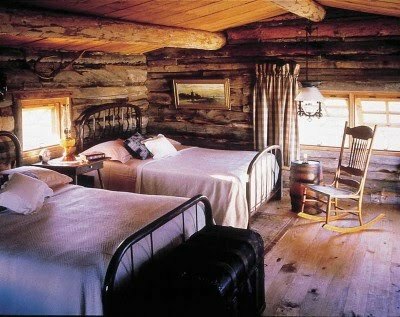 I love the combination of the simple white bedspreads with the old iron beds. A rustic cabin is the perfect place to display repurposed furniture and this vintage snowshoe coffee table is fabulous. Not all cabin decorating has to be dark. 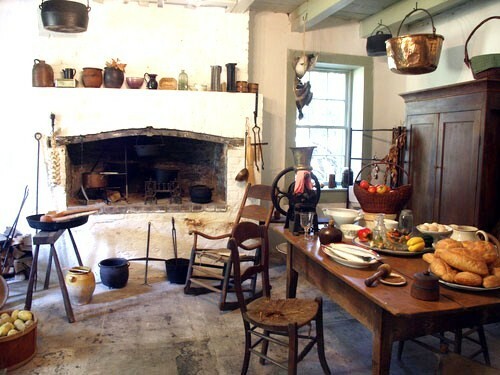 One of my favorite looks is a white rustic country kitchen. and a white rustic background in the kitchen is a perfect place to display an eclectic mix of yard sale finds. 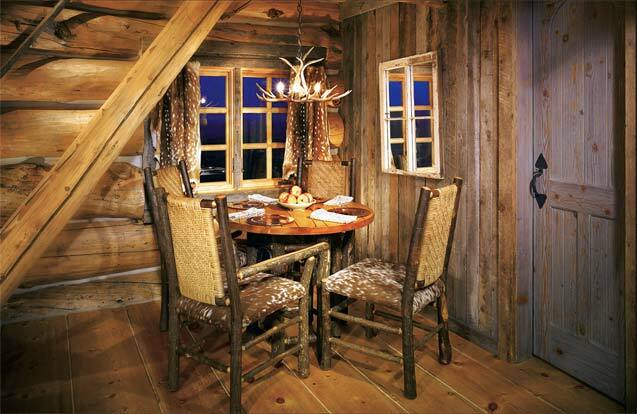 Cabins make me think of small cozy nooks, like this intimate dining area. Natural woods add to its cozy feel. a fireplace in the kitchen would really be nice. Well, I think it is time for me to wake up and smell the coffee. Lots of work to do today. Hope you have a wonderful daydreamy kind of day. Love all the images! 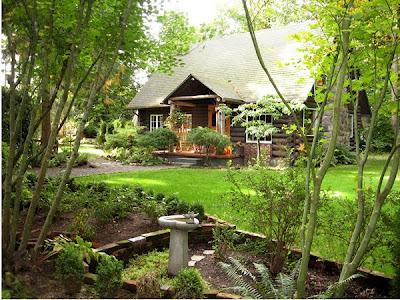 Rustic cabin is gorgeous! I love the rustic look. My MIL and FIL live in beautiful log cabin that he hand built ages ago!! They have knick knacks everywhere, on the walls, on the antique and vintage furniture. In her kitchen she has the most beautiful (and most inefficient) windows that are wood, painted white, long and tall and open into their wooded front yard. Yummy! 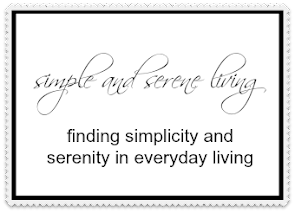 I love your blog posts for inspiration. I'm looking forward to one with cottage style inspiration, maybe?? Wow Laura, those rooms are incredible. I love the rustic look, I used to live in a very rustic home with logs and antlers, coyote skins, etc. Not anymore, we moved and my tastes changed to French decor, but I still like the rustic cabins, well I have to admit that I still have my living room with leather seats and knotty wooden tables, I like to keep like themed rooms, may be one day I will post pictures room by room. Thank you for your nice comments on my blog, happy to follow you too! Now I want a cabin. Those look so neat. Thanks for the pictures. I'm just loving those photos! I could live in a cabin for sure. I love vintage. New follower from the weekend hop. If I had my way, I would live in one, out in the woods by a river. I love the look of them, and how they "make you feel like you're at home" even if you are just looking at a photo of one and day-dreaming that you're there. Hi, new follower from the Weekend hop. I absolutely love your blog! I love rustic and I am going to have to visit your Esty store...I already see lots of stuff I want! ;) Glad I found you! Great finds! I love the snowshoe coffee table and the fireplace in the kitchen! I can just see an old cast iron pot of stew cooking in that one! I love all of the rooms but oh that bedroom is warm and cozy..love-it!! I love the snowshoe table...genius! Love this look! Looks like a relaxing place to get away for the weekend retreat! So cozy and natural. Oh I adore the coffee table made out of an old snowshoe! Such lovely images, they look very warm and cozy. I especially love the white kitchen. I wanted to thank you for your visit and for following our blog, I have followed yours as well. Now I'm off to look around your beautiful blog a bit more! Hi Laura, Such beautiful photos. I've always had this dream of living in a log cabin. I just love the rustic look, it's just so warm, cozy and comfortable. Thanks so much for stopping by and following me, new follower here also. I love rustic decor. One of my favorite stores in the world is Gorsuch Home. I like the light and airy version best, although I think it's fun to mix just a tiny bit of dark wood with the white. I am back from break, reading my favorite blogs. Hi Laura, I really love this look for fall, too. So comfortable and easy for a lake place. thanks so much for sharing the inspiration at VIF!! Hello Dahlink, what a fabulous blog you have here. I found you through the 'Just Winging It' Blog Hop. Those photographs of the log cabins are awesome. I tell you what, I would die for that white kitchen. And the rest of the rooms look so homely and comfy! Anyway, I am now following you. Awesome way of doing such kind of projects. you have really a nice views on it. i must prefer to own such kind of furniture.